This Bookreporter.com Special Newsletter spotlights a book that we know people will be talking about this spring. Read more about it, and enter our Spring Preview Contest by Tuesday, March 21st at 11:59am ET for a chance to win one of five copies of FOLLOW ME DOWN by Sherri Smith, which releases tomorrow. Please note that each contest is only open for 24 hours, so you will need to act quickly! 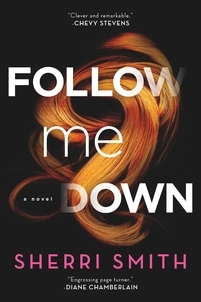 FOLLOW ME DOWN is a rare find --- a gutsy, visceral and beautifully crafted psychological thriller that Diane Chamberlain called "an engrossing page turner [that] will keep you guessing right up to the delicious ending" from talented new author Sherri Smith. Mia Haas has built her life far from the North Dakota town where she grew up, but when she receives word that her twin brother is missing, she is forced to return home. Back to the people she left behind, the person she used to be and the secrets she thought she’d buried. Once hailed as the golden boy of their town, and now a popular high school teacher, Lucas Haas disappears the same day the body of one of his students is pulled from the river. Trying to wrap her head around the rumors of Lucas’ affair with the teen, and unable to reconcile the media’s portrayal of Lucas as a murderer with her own memories of him, Mia is desperate to find another suspect. All the while, she wonders: If he’s innocent, why did he run? As Mia reevaluates their difficult, shared history and launches her own investigation into the grisly murder, she uncovers secrets that could exonerate Lucas --- or seal his fate. In a small town where everyone’s lives are intertwined, Mia must confront her own demons if she wants to get out alive. - Click here to visit Sherri Smith's website. - Connect with Sherri Smith on Facebook and Twitter. This is a special newsletter for our Spring Preview Contests, which will mail on select days in March and April. This newsletter is separate from our weekly Bookreporter.com newsletter, which mails every Friday. You can subscribe to that newsletter here. Don't forget to visit the other websites in TheBookReportNetwork.com: 20SomethingReads.com, ReadingGroupGuides.com, GraphicNovelReporter.com, Teenreads.com, Kidsreads.com and AuthorsOnTheWeb.com. And be sure to connect with us on Facebook, Twitter and Pinterest.